A mudra is a gesture, usually done with the hands, that focuses and directs energy in a yoga pose or meditation. Mudras are ancient in origin. Most of the ones used in contemporary yoga come from Hindu and Buddhist traditions. Mudras are also sometimes called seals since you are actively joining two parts of the hand. This is thought to create pathways for energy (prana) to flow and to help unblock the chakras. The hands are covered in acupressure and reflexology points, which may explain the healing effects of some mudras. Others are more symbolic in nature. Like other aspects of yoga (asana, pranayama, and meditation, for instance), consistent practice is key. Mudras are not a quick fix. Though they can be done anywhere, they will be most effective when incorporated into a meditation or relaxation routine. Mudras are often used in Kundalini yoga . 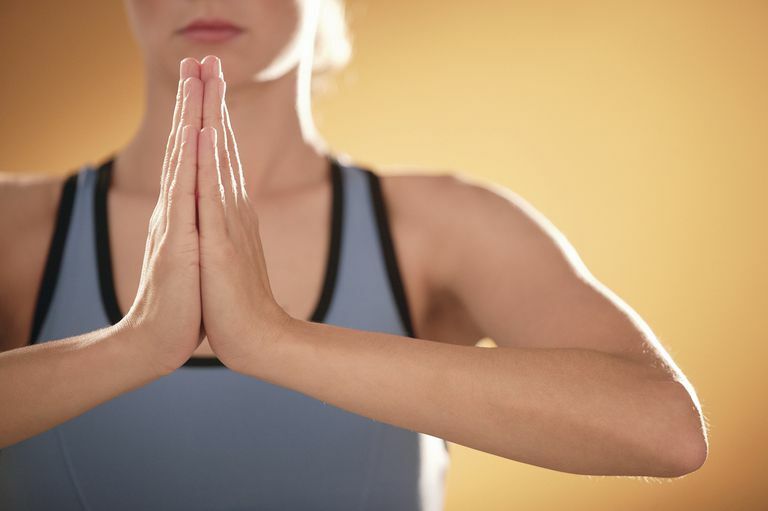 You may already be using mudras without realizing it. The most common one is sometimes called prayer or namaste position but is more accurately described as Anjali Mudra. Anjali Mudra: Press the palms of the left and right hands firmly into one another. This mudra is thought to have a calming effect as it brings the left and right sides of the brain into harmony. Gyan Mudra: Press your thumb and forefinger together. Extend the rest of the fingers straight. When you are seated in a cross-legged position, rest the backs of your hands on your thighs. This mudra symbolizes unity and connection. It is also called Jnana (Knowledge) Mudra. Vishnu Mudra: The index and middle finger are bent in toward your palm. The thumb, ring finger, and pinky remain extended. This is the recommended mudra for alternate nostril breathing (nadi sodhana). Garuda Mudra: Hook the thumbs of your right and left hands together by crossing your wrists with your palms toward your chest. Extend the rest of your fingers. It looks like a bird, which makes sense because Garuda is from the same root as garudasana (eagle pose). This mudra is considered invigorating and balancing. Dhyana Mudra: While seated, put your left hand in your lap with your palm facing up. Place your right hand on top of your left and bring your thumbs to touch above your palms. This is a classic Buddhist meditation mudra. Lotus Mudra: Bring your palms to touch as in Anjali Mudra. Keep your thumbs, pinkies, and the bases of your palms pressed together as you separate the centers of your palms and fan out the rest of your fingers. This makes a shape like a lotus flower. This mudra represents openness and blossoming. Kundalini Mudra: Make a fist with your left hand. Extend your left index finger and make a fist with your right hand gripping that index finger. The thumb of your right-hand rests atop your left index finger. This position is associated with sexuality and unity. Hirschi, Gertrud. Mudras: Yoga in Your Hands, Weiser Books, 2000.